Your average painting consists of two main ingredients: paint and a canvas. Typically, this canvas is something detached from the artist himself, perhaps a wall, a backdrop, or paper. By exploring the relationship between artist and art, Russell Powell challenges this custom. Russell Powell, a painter from California, takes out the tradition medium. He confronts the idea of merging art with the human body. 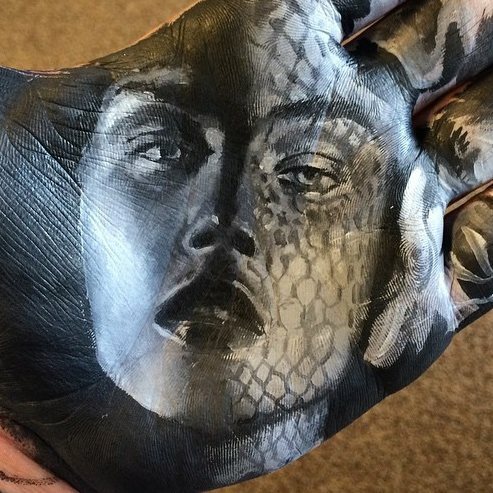 Powell paints tantalizingly detailed paintings onto his own hand, and proceeds to touch his painted palm onto blank paper, for a process he has dubbed “hand-stamping.” His signature paintings are intricate portraits, particularly of celebrities. With his brush strokes, he incorporates colors, textures, and fine details onto a very familiar medium. The videos below outlines the steps in the “hand-stamping” process. You can contact Russell Powell through his website, http://www.pangaeanstudios.com.